I think sprinting is the first step to learning proper running mechanics. If you just train distance paces and do non-running training in the gym, then you're not giving your neurological system a chance to learn to recruit and synchronize the correct muscles for running power and propulsion. Hill sprints are a popular method for distance runners to practice this, like 8 seconds of 100% effort up a 7% grade hill, then take full recovery (2-3 minutes walking around). Start with only 1-2 reps and build up to 8 reps.
Also to note is that Kipchoge is said to be nowhere near being able to touch his toes during a basic hamstring stretch. Sufficient flexibility is important but excessive flexibility can be a disadvantage in running. Or simply a waste of effort. Finally I'd note that a body's unique biomechanics or exercise history can prevent an individual from achieving the ideal running form. Probably in looking at pros running, you've noticed quite a large variety of forms. If you've spent a lifetime developing one way, especially if it suits your particular body, then no amount of attempting to change it will result in a superior result, even if your body theoretically has a more efficient way to operate. Of course that's not to say that no one has ever made a beneficial correction, but rather just to say that there practical limits. Hmm to my knowledge all sprinters use mostly muscle tension. I do hill running once a week. (8x150m). Very true. I've learned that after the first year. During that time I've made many mistakes, but none of it isn't irreversible since it's not a long period of time (I hope so). Now I stretch more wisely and don't force things. I guess the body will adapt best elasticity for running while doing running. I don't mind that it will take a lot of time, my body tells me that this is the way to do it, so I follow it. I listen mostly to my body now. I read something on the net about technique and I only take it as a hint, I make the final decision only if it feels right. I do hill running once a week. (8x150m). That's a very different kind of exercise. 150m hill reps are more of a workout while the hill sprints I'm talking about are really just technique work. They are kept short enough with long enough recovery that you don't feel any more tired on the last one than on the first one. They're just meant to give the neurological system an opportunity to work on optimal neuron firing for running. The body doesn't figure it out as well when some muscles are fatigued or when running at lower efforts. So this repetition of sprinting all-out with enough recovery to keep yourself fresh is really good for technique. Think like this: if two identical people both tried to jump as high as they can, they'd jump an equal height. Now if you can magically hold the physical ability of their bodies constant, and only allow the brains continue to develop what happens when their minds think "jump as high as you can", and then one guy regularly tries jumping as high as he can while the other guy only does little jumps and does other exercises like squats, then the guy practicing jumping high is going to improve a lot and become clearly better. Take even further: the first guy jumps only if he's 100% fresh and the other guy tries to jump as high as he can too, but only when he's tired, like at the end of a rep or at the end of a whole workout, then the first guy will still win. So whatever form you are developing, I think that this kind of technique work that you get from sprinting, whether on the uphill or on the flat, is helpful. Even if you don't care what your top speed is, the neurological patterns that your brain develops have a trickle-down effect that makes lower efforts and slower paces more efficient. I do realize now that new running technique won't get me great results instantly. In the videos I've pasted the Triathlon runner (#1) runs 10k in 29min, while the Kenyan runs 10k in 27min, so it's not that big difference in the end. Eliud Kipchoge runs using the spring technique while Mo Farah is using standard technique and the difference in marathon between these two isn't that big as well (3min). First of all, the gaps between what you listed are HUGE. HUGE. Two minutes over a 10k is an almost comically different level of performance. The key thing is that the differences between the two are not in their technique, although running economy does play a role in how fast you can run. The difference between the two is in there fatigue resistance and natural abilities. Farah is a 3:28 1500m runner, Kipchoge could never dream of running such a time. Farah has vastly greater FRC (anaerobic cap) and generally better speed. As a typical rule, guys with large anaerobic engines tend to not to have quite the same endurance, and indeed we see this the case, as Kipchoge would crush Farah at HM or M where anaerobic cap is but a small portion of the necessary power. Kipchoge flat out has a bigger aerobic engine than Farah. 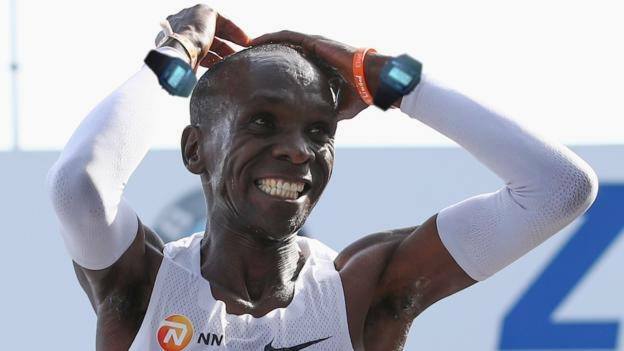 If it was purely technique, Kipchoge would just flat out be faster than Farah at everything, but it's not. Farah is a much better 1500m runner, a better 5000m runner, probably even with Kipchoge for 10000m, and then Kipchoge is better out past 10M or so. Just like with the 10k though, the difference between a 2:01 and 2:05 is VERY big. However I love the feeling of the new technique during running. My body is telling me that this is natural and that I should be running like this, so I keep on trying. I like the changes it makes to my body, I am more relaxed and it motivates me to strengthening my core and I feel that my body gets stronger every day. I walk more straight, I sit more straight and I feel flexible like a cat. It's a great journey for my body. I also got rid of all the injuries I was getting all the time (shin splints, stiff tendons) after changing the technique. Working on technique and fixing issues with your form is definitely a good thing, especially if you have flaws or are getting injured. Since it's satisfying, fun, and reduces your injuries it seems like a very wise decision to keep working on it. Just don't expect that to lead to better performances. If you did only technique work every day, you would definitely get slower over the next 3, 6 or 12 months. However, if you work on your "engine" while also improving your form you'll get faster. It's just that engine accounts for 90% of it or more, and from perhaps 10%, unless there are severe issues with how you run. What NonY is saying is also very true. One thing they have found is that the biggest aspect of running economy (which, for performance, is what matters at the end of the day, i.e. whether you use more or less oxygen to run a given pace) is ground contact time. Runners with poor economy tend to have "lazy" foot strikes, where their foot stays in contact with the group longer, resulting in greater friction and more slowly down. Runners with the best economy tend to have good "pop", which their foot quickly imparting the necessary force to the ground. Sprinters are the best at this, sprinting is all about applying power to the ground as quickly as possible. Training sprinting, as NonY says, trains the neuromuscular system/brain-body connection to recruit muscle fibers in the fastest, most efficient way possible, translating to all the components of good form. What affects ground contact time? I guess speed and cadence, or are there other factors? At the moment most of my energy goes into strengthening core muscles. I try to activate my core muscles throughout all day no matter what I do (sit, stand, walk and even when I lie in bed) by maintaining a better pose that engages these muscles. I guess the stronger core muscle get the better runner it will make me. Although this becomes very exhausting sometimes, my hip muscles and lower abdominal muscles are so tired now. But from what I understand our core muscles are designed to be tense 24h/day and it will get better with time I just need to make them strong enough. The running style of Kipchoge and some other Kenyans (not all of them though) probably resembles most the concept of Chi Running where your goal is to run with relaxed body. I can often hear commentators saying that Kipchoge is so relaxed and smiling at the 40 km! Running relaxed is so much more fun. I've read a bit about chi running and they suggest to engage your deep lower abdominal muscles, so that they work hard to keep a proper pose. When these deep abdominal muscles take over maintaining proper pose, most of your other muscles in the body can better relax. I've read in some interview with Kipchoge that he said I quote "you need a very strong stomach" and what I think he meant by that are abdominal muscles that work very hard in his style of running. I feel that my body resilience works best when my body is relaxed. When the lower abdominal muscles work very hard I can relax my hip muscles better and spring mechanisms in the hips work more efficiently. I feel that I run lighter with less effort, though the abdominal muscles work hard and it is exhausting with time. A big part of it is fatigue, when you get tired you are more likely to let your heel drop and make contact with the ground, you'll get better at springing off your toes as you build more stamina. It sounds like you are on the right path since you are actively thinking about engaging the correct muscles for efficient running and otherwise staying as relaxed as possible. Kipchoge is the epitome of that. I think the most important thing is to focus on form when running, especially at the ends of long runs and workouts. There are a lot of people who do mindless miles where they daydream or listen to podcasts or chat with running buddies. And then when they run workouts and get fatigued, they start using a desperate effort to hit predetermined paces rather than keeping a strong smooth form and running by feel. If you are regularly a mindful runner (doesn't have to be every mile you run) and more importantly if you practice good form when you are your most fatigued, that'll help you have good form when it matters in a race. Just like with the sprinting technique work, I'm a big believer that the majority of progress is available to be made when actually running. Lunge matrix and leg swings (LM + LS) for warm up. And then some assorted exercises for post-run to work on strength and mobility (SAM). Mindful running, sprint technique work and LMLS + SAM will get you 99% of the way to good form imo. Some people may need some coaching to really understand it all and do it correctly but I think the vast majority of people will end up having efficient form if they did those 3 things for a few years. Some special cases may need to really target a weak link in the chain if they are still sloppy a few years in. I love Kipchoge not only for his running capabilities, but for his running spirit. He is my idol I relate to him much, he also wears the same Casio watch as I do, even two, see it for yourself! So true about thinking on running form at the end of long runs. I feel my body and my muscles best then. When tired after a long run it is natural to try optimize the form, so that you run most efficiently. I've stopped listening to any music during workouts, I feel like it is a waste of my time if I don't focus entirely on the training. Regarding the LM video - a comment of mine on the pose. The guy has a good pose, but in my opinion it's not perfect. With Kipchoge you can see his head with neck being pushed far backwards and it allows you to get even more straight, but it requires hard work of the lower abdominal muscles. It seems this is all connected, I feel it and it makes sense. Your core muscles start in your lower abdominal, go through hips, loins, long back muscles, arms, and end in your neck muscles. I feel that all these core muscles work best when activated together at the same time to create one strong combined muscle. If you don't push the neck with head backwards then your spine ain't really perfectly "straight", as the spine works as a whole I think. If you don't straight your spine in the top then it won't be perfectly straight in the bottom. A few months ago I've started hanging on a pull up bar (just hanging) and it helps me a lot to stretch my neck/arm/back muscles and get my body position more straight. While hanging I activate my lower abdominal muscles and keep my hands in line with my ears. Hanging on a bar is like a monkey hanging on a tree branch, I guess it's a natural thing for our bodies. I shouldn't overstretch or anything by just hanging, right? I think improved running economy is something that helped me run my recent 10k PB. My friend who took photos of me on the last meters before the finishing line, commented that I didn't nearly look as beat up as last year. The photo series she took indicates much better running form compared to last year, when I was in better shape but only had half a year vs 1.5 years of running experience. Funny, I discovered exactly these about 2 weeks ago, when I decided I need to do more supplementary work if I want to keep this running streak up and shoot for a 1:24 HM this year. Now I go out every morning and while my watch is searching for a GPS signal I'm doing the lunge matrix and leg swings, that part's real easy to get done daily. I need to do SAM stuff more regularly but I'm getting there. add 1 quality session per week, slowly increase the weekend long run and aim for about 200km in february, then see how I feel and maybe throw in a cut back week before hopefully increasing training load a little more in march. Well, I'm in the process of trying to unfuck myself. It's been quite a long journey getting here. Basically anxiety/stress/repressed stuff related started causing a variety of symptoms, starting with the palpitations/PVCs back in late 2017. Stress over that, as well as continued repressed stress, just built and even though at times I felt I had it under control I think it continued to fry me, and I continued having bizarre list of symptoms (the list is really ridiculous, it's insane what stress/anxiety can do to you) ranging from headaches, to GI issues, to random numbness, to tinnitus, etc. Took a long time, and a decent number of doctor visits to more or less make sure, and mentally accept that there is no physical illness, and it's all psychosomatic. But either way, things really came to a head in mid December with a new symptom: twitching. Started in my foot, brain remember some connection between twitching and ALS, got a huge anxiety spike, twitching spread all over my body. Just random partial muscle contractions all over the place, all the time. Anything from baby ones I couldn't even feel to huge thumpers that almost moved limbs. Also had some pretty bad days with nausea lasting most of the day. Eventually calmed down a bit, but I think what was remaining was fried. Started to cramp up randomly in various places, and started developing exercise intolerance. At it's worst, I did a solid hour ride...and was laid out with legs that felt "tight", very similar to the feeling you would have after smashing it for 5 hours and waking up the next morning, except it lasted for about 4 days. Bottom line, repressed stress + anxiety really mess up the body. I think I've figured out pretty well what the issues causing the stress were, and am at a place where I accept that I'm not dying of anything to help with the health anxiety side of it. I think it's a matter of fixing those issues + time and this will eventually improve. My plan right now is to start with 3 days a week of just 15' of exercise, lightish intensity, and build back to 5 days a week, then gradually add time for a few months (hopefully the timetable is months, rather than years) as decreasing anxiety and return of normalcy allows. @L_master Sorry to hear that. I wish you good luck in getting back into form. I've also had a month break due to health issues. It's mostly GI issues with bad chronic inflammation which gets worse when doing hard physical activity. So I am now starting slowly, not many km, just trying to run every morning. Btw. nice starcraft casting. I started doing a proper running program at the start of this year. All of last year my main source of exercise was lifting at the gym but I found it really boring , I don't like the atmosphere and the people who regularly go to my gym and I wasn't eating enough to put on a lot of muscle. Plus i'd get really down or stressed if I missed a session. I don't think i'd suit getting big anyway, I've always been quite lean and prefer that body type. In school I was ok at endurance sports so I decided to move over to running. So far I've really been enjoying it. I like the freedom and sense of well being that comes with just putting on your trainers and getting outside. Much better than being in a sweaty room with artificial lights and terrible music. I started off the year doing a 5km in 25 minutes but last Saturday I did my first park run which is a 5km with a couple of hills. Ended up with a 21:15 and finished 12/ ~200 people which I was really happy with. The community around running seems really friendly and supportive. Plus there is a nice competitive aspect to it. My friend suggested I try a half marathon so I've got that lined up for the beginning of April and i've been training for that for about 3 weeks. I don't really know how it's going to go but I can do 5:00/km pretty comfortably so I want to hit 1hr 45 and finish strong, mostly just try and enjoy the experience. If anyone has advice for your first half marathon i'd appreciate it. After that I'm not sure what I will move on to, if I really like the half marathon I will sign up for more and make that my focus distance, if not I think I will look at 5k or 10k competitively depending on what's available. My current training is running 4 times a week and gym three times a week, I end my gym sessions with 30 minutes of cross training like stairs/rowing. My gym sessions are full body workouts twice a week with my 3rd gym session being a core session which I do on the same day as my long run so I get to have a full rest day once a week. I do a really light work out every morning just a few push ups and ab wheel , just to wake myself up more than anything. I find the gym more enjoyable now I'm going less. I don't feel the pressure of the stupid macho culture , i'm not going there to sculpt my body , i'm going to support my running which gives it more purpose and makes it more motivating. Strava and a GPS watch have really helped as well, helps me see the progress and adds a competitive aspect to every run. The weakest part of my program is my diet. I'm 6ft and at the start of the year was 79kg I think that's too heavy for a runner, I'm down to 76kg currently, not sure what the ideal weight is but I want to cut out the crap food and just eat a bit cleaner. I have no idea at the moment if I should be eating at a calorie deficit to cut weight or keep my calories up to make my training better. Anyway , long post over just wanted to share how it's going and ask for any advice. 20:50 for the 5k park run today. Was pretty muddy and slippy all the way around but I'm happy with a new pb. I'm sure I will hit a plateau soon but at the moment I'm enjoying watching my times get lower every week. Congrats! It's nice to have a PB that was in slow conditions so you get a PB and also feel confident you can get another. If anyone has advice for your first half marathon i'd appreciate it. I'm not the most experienced runner and I only ran one half so far (2nd one also coming up in april) but your plan sounds good to me. With your recent PB in the 5k your aerobic fitness should allow for a 1:35-37 if you're able to race the half equally as good and your legs have the endurance. But if you're not as experienced with pacing the much longer distance and haven't done many longer runs it's really unlikely you'll be able to get that close to your theoretical limit. So personally in this position I'd count breaking 1:45 as a successful race and be super hyped if going sub 1:40. Since you want to finish strong I think aiming for the 1:45 is a good choice, especially for a first half. If you aim for 1:45 and can speed up a little towards the end and come in at 1:43 it'll feel way better than coming in at 1:42 while you went out at 1:40 pace but struggled to hang on and suffered way too hard for the last half hour. My own training is going pretty well so far. My biggest problem right now is to avoid being stupid! I know I mustn't push too hard and injure myself, but especially with the race dates coming closer (10k in 3 weeks, half in 5 weeks) it's so hard to contain myself at times and not want too much and not ignore the signs my body gives me. My plan worked out really well, finished february @221km - second highest mileage month ever despite being so short! This wednesday I hit day 75 of my running streak and everything's almost perfect. My hip started acting up (again) after the long run 2 weeks ago and hasn't been perfect since. I cut down the long run distance last weekend and this week was reduced distance as planned. I didn't think I could feel this rested after running 40km in a week Now comes the tricky part to not force the planned 3 weeks of higher volume & intensity if the hip gets worse again. Fairly certain it's a hip flexor/glute imbalance and I gotta keep working on it. Fingers crossed! 3 weeks of around ~60k with 1-2 quality sessions and a weekend long run. The last long run will be replaced with a 10k race after which I'll begin a taper for the half 2 weeks later. I feel my fitness has improved since january and I'm somewhat confident I can break 39 in that 10k. Depending on how close I get to 38 I'll actually go for 1:24 in the half or adjust plans accordingly. Funny side note: that 10k will be day 100 of my running streak, so I'm weirdly excited for it even if it's just a fitness check for the more important half marathon. I plan to take it real easy after that for 2 weeks to recover both physically and mentally before the next 10 week cycle for another half on the last weekend of june. Thanks for the advice. Good luck with your training and races, you've done a really impressive volume of running so far. When I first started out (1.5 years ago) I hit around 30km in a week and was impressed with myself, only to notice the next week, that it just wasn't a volume I could keep up without quickly injuring myself. Last week was my planned cut back week and I noticeably recovered while still running 41km. Running taught me a new kind of patience with myself, to look at others for inspiration but always remember to not get frustrated just because I'm not as fast and maybe never will be. Instead focus on improving myself and "run my own race". Very poorly paced run. I was too hyped up for the start and took off, coming through the first 1k in 29:30 pace. It was too much and I couldn't stabilize without the pace slipping a lot for a while. I finally got back on pace at the end in order to salvage it a little but sub-31 wasn't in the cards at that point. But it gives me hope that if I start at the correct pace at my goal race (a 12k in May) that I can run a good race. I started so much faster than I needed to and it wasn't crazy. I think if I can manage to start my next race well then my goal pace will feel very comfortable at the start.